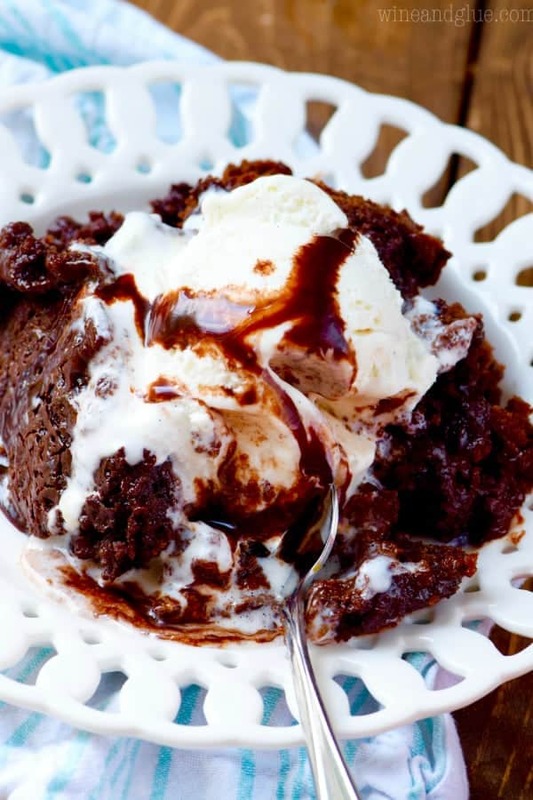 These Slow Cooker Hot Fudge Brownies are FOUR ingredients and absolutely amazing. I will not judge you if you eat them STRAIGHT from the crock pot. You guys!! My good friend, Hayley, author of the hilariously funny and amazingly delicious blog, The Domestic Rebel, wrote a cook book! You guys. Hayley is kind of killing it. She already sold out on QVC and her book is flying off the shelves so fast that they already signed her to a second book! A. Second. Book. 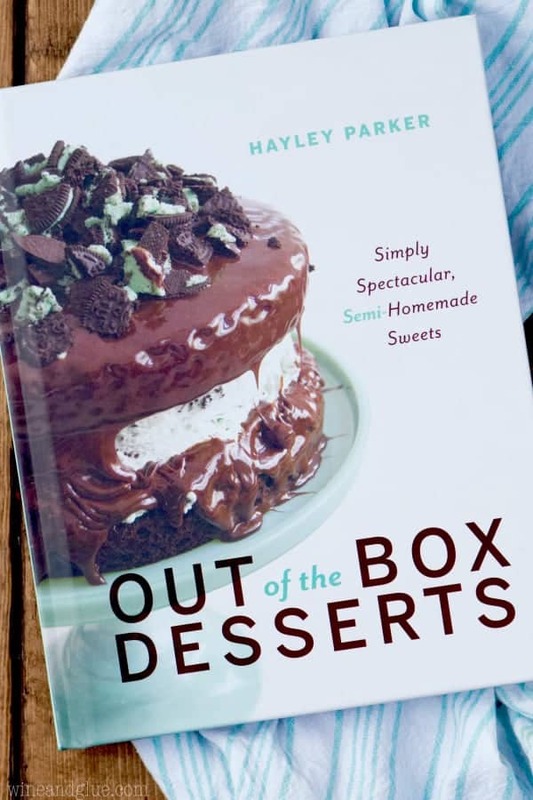 But let’s just talk about her first book, Out of the Box Desserts, for a second. It is so good! There are so many amazing desserts in there that all start with a box mix. 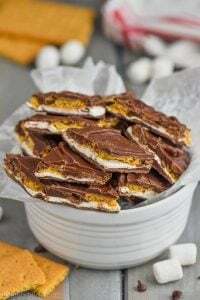 They are easy, they are ingenious, and they are totally delicious! 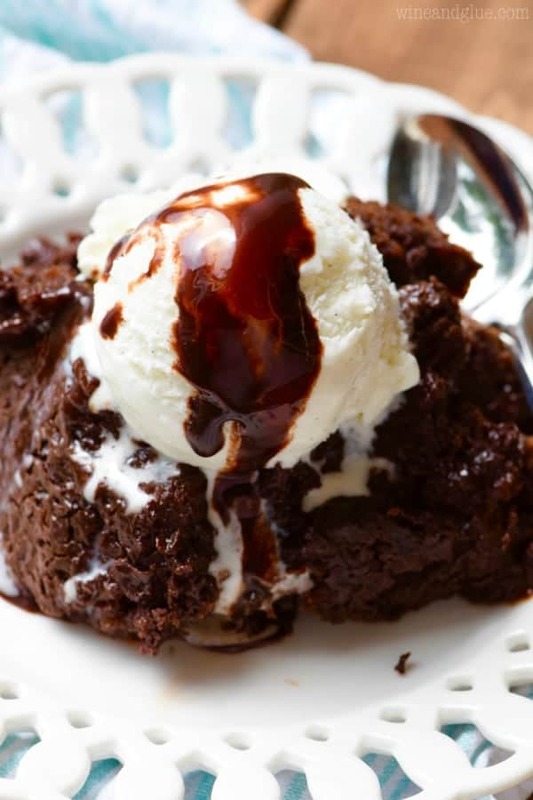 I made Hayley’s Slow Cooker Hot Fudge Brownies, and they knocked my socks off. 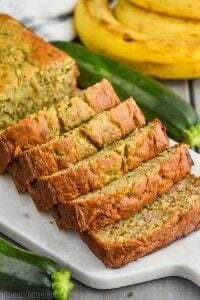 They come together with just FOUR ingredients (plus some water). You can literally throw them together in under five minutes and then serve them up piping hot and warm at the end of a dinner party topped with some ice cream. Your guests will be totally blown away and you don’t even have to tell them that all the magic started with a box mix. Seriously. I challenge you to find an easier more decadent chocolatey dessert to woo people with. It cannot be found. Please note that all slow cookers are a little different. Hayley suggested that you cook this on HIGH for 3 to 3 1/2 hours. That was a little too long for my slow cooker that loves to be the consistent over achiever and cook things faster. We, as in my slow cooker and I, felt a little better about 2 to 2 1/2 hours. Just something to keep in mind. Also something to keep in mind? I won’t judge if you eat this strait from the slow cooker. 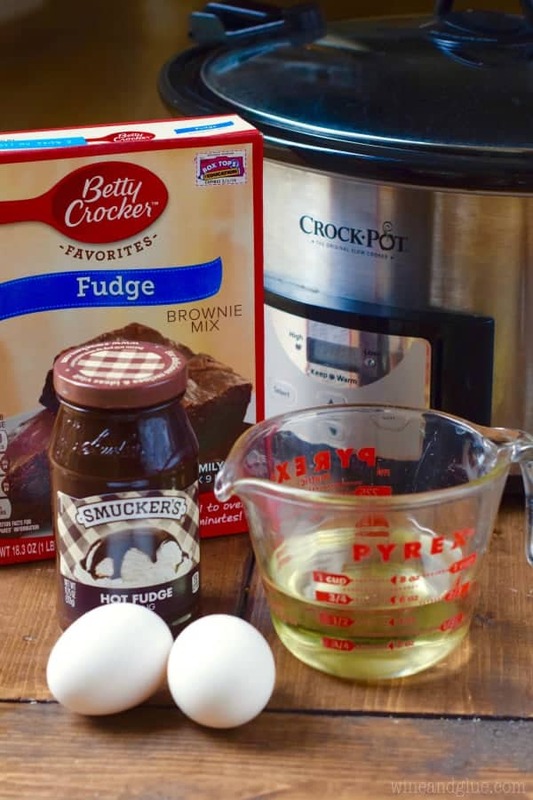 In a large bowl, combine the brownie mix, oil, 1/4 cup water, and eggs until combined. 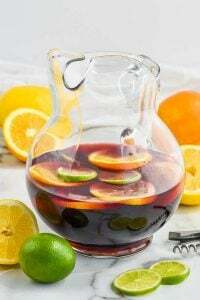 Pour into the prepared slow cooker. Whisk together the hot fudge sauce and hot water. (Feel free to use the same bowl you mixed the brownie mix in without cleaning it out). Pour over the brownie batter. Top with the lid and cook on HIGH for 2 to 2 1/2 hours. The brownies will be gooey in the center at the end of cooking (though the edges should be fully set). Scoop out and serve with a spoon and top with ice cream. Wow. These are awesome. I have this happy vision of myself flinging ingredients into the crock pot while singing and then digging in a few hours later with a spoon. Somehow, my kids are not in this picture. Hmm. The book is incredible. I want to make everything in it! I’m glad she got another book deal! What size crockpot did you use? This looks amazing! Hi…how many servings did this make? If I were to double it, what would you suggest for cooking time? Hi Amanda! Serving size .. . . one? Just kidding! I would say that this would make about 24 servings if you are including ice cream with them. If you are going to double it you are going to just have to watch it. I don’t think you would need to double the cooking time. But I’m not exactly how long you would need. Can i use a gluten free brownie mix and achieve tbe same results? I haven’t tried this with a gluten free mix. If you do, let me know how it goes! If I used applesauce for an egg alternative do you think I’ll need to adjust anything else? That is a really hard question because I’ve only used applesauce as a replacement for oil in recipes. If you try it, let me know how it goes! Does it matter how long you leave it in the crockpot until serving? I would say that you run the risk a little of it over cooking if it is kept on the warm setting. I would suggest that you just unplug it when it is done and keep it covered until you are ready to serve. It will stay hot, but won’t keep cooking. Every time I make these the edges burn so quickly that the middle doesn’t have time to cook at all. What am I doing wrong? I don’t think you are doing anything wrong Caitlin. I mention in my salted caramel version of these that mine was perfect at 2 1/2 hours. It was set at the edges but gooey in the middle. 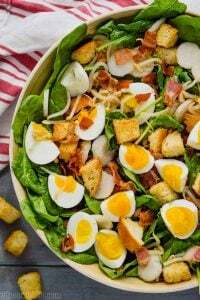 If you are concerned about undercooked eggs, you can use pasteurized eggs and it should be fine!